Logitech today unveiled a line of iPad and Android tablet accessories. The global provider of personal peripherals for computers is just another company that wants to cash in on the tablet craze. There are four tablet accessories in the new Logitech lineup. Let's run through them. The Logitech Keyboard Case, created in collaboration with ZAGG, features a sleek aluminum cover with military-grade, high-density padding. The protective case wraps around the iPad 2 to cover the screen and sides, and uses Bluetooth connectivity to quickly pair the keyboard. It also adds a recess just behind the keyboard that props up an iPad 2 in portrait or landscape mode. The Logitech Keyboard Case is expected to be available in the US this month and in EMEA beginning in June for a suggested retail price of $100. The Logitech Wireless Speaker eliminates cables and lets you place your speaker up to 50 feet away from your iPad or Android tablet (subject to use, settings, and environmental conditions). You'll get rich, full stereo sound with your speaker's dual two-inch drivers and plenty of bass. A rechargeable battery powers your speaker for up to 10 hours depending on your use and settings. It pairs with your tablet using Bluetooth wireless. The Logitech Wireless Speaker is expected to be available in the US this month and EMEA beginning in June for a suggested retail price of $100. 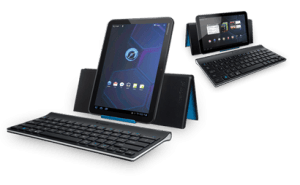 The Logitech Tablet Keyboard, a keyboard-and-stand combo, comes in two versions, one for Android tablets and a second for iPads. It pairs easily with your tablet over Bluetooth wireless, so you can use it within 30 feet of your tablet (depending on use, settings, and environmental conditions). The Logitech Tablet Keyboard for iPad is expected to be available in the US this month and in EMEA beginning in June for a suggested retail price of $70. The Logitech Tablet Keyboard for Android is expected to be available in the US this month for a suggested retail price of $70. The Logitech Tablet Mouse pairs with your Android tablet using Bluetooth, and offers smooth, accurate laser tracking, as well as side-to-side scrolling. It is designed specifically to work with tablets running the recently announced Android 3.1 (codenamed Honeycomb) platform. The Logitech Tablet Mouse is expected to be available in the US this month for a suggested retail price of $50. "People love their tablets — the category is growing quickly and is here to stay," said Azmat Ali, Logitech senior director for tablet products. "We've created a great lineup of products for tablet users, and it's just the beginning. Over the coming months you can expect to see additional products for iPad and Android™ tablets that are designed to help people create, consume and communicate."